Predators center David Legwand has been a part of the franchise since its inception after being the No. 2 pick in the 1998 draft. NASHVILLE, Tenn. — Just outside the team locker room deep in the bowels of Bridgestone Arena, a wall is covered with charts recognizing all the individual and team records of the Nashville Predators. As the only Predator to play for the team every year of its existence since 1998, it’s no surprise David Legwand fills many of the slots, including being franchise leader in six different all-time categories. "I have grown up here as a person and a player," said Legwand, the expansion team’s first draft pick who was taken second overall in the 1998 draft. "It’s been good. You’ve seen the city grow. You’ve seen the hockey fans grow." While the center heads into Thursday night’s home game against Carolinaholding team career records ingames played, goals, points, assists, game-winning goals and shots, he has always had to carry the mantel of being that first face of the franchise. But as a two-way center known as much for defense and skating skills as offensive production, there are those who feel that he has been an underachiever in regard to somewhat unrealistic expectations put on him from the outset when he played his first NHL game at age 18. "Just a good, solid, all-around hockey player who helps the team win hockey games and do the right things on and off the ice," Legwand said of how he would like his career thus far to be analyzed. While the overall numbers might add up to steady production, he has only scored 20 or more goals in a season just twice, including a career-best 27 during the 2006-07 season. He also had a career-high 63 points that year, helping the Predators to 51 victories, their most for a season. "He’s a Predator through and through," said Predators coach Barry Trotz, who like Legwand as a player has been head coach of the team since its inception. "He has talent. He’s a good person and a good teammate, and he is and always has been a popular person within the locker room.He’s been a valuable part of the organization throughout our history." Heading into Thursday’s game, Legwand is leading the team with 20 points (five goals, 15 assists) while recently centering the third line along with forwards Gabriel Bourque and Viktor Stalberg. That means Legwand’s line usually draws defending the opposing team’s top line. "We’re a good group of character guys," Legwand said. "We’ve had some injuries, but we’ve battled. We’ve had a tough road schedule so far, and we’re staying in the thick of the fight. And that’s the plan." Those injuries include being without standout goaltender Pekka Rinne, who has missed most of the season with a hip injury. Star defenseman Shea Weber will miss his third game tonight after taking a puck in the face last Thursday, but could return as early as Saturday’s game at Washington. Also out with a foot injury is veteran defenseman Kevin Klein. Legwand has helped pick up the slack. 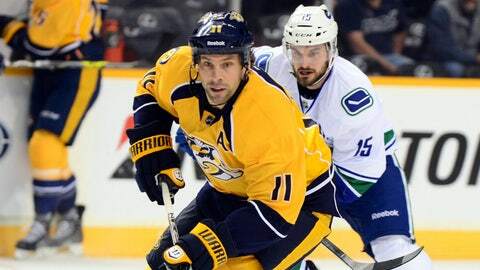 Veteran forward Eric Nystrom joined the Predators this season after stints with Calgary, Minnesota and Dallas and has faced Legwand numerous times over the years. "(Legwand’s) skating is incredible," Nystrom said. "I think that’s one of the reasons why he has been so effective and played so well for so long. He’s a big part of this team, and we need him to keep doing that 15 years later." Trotz agreed that Legwand’s attributes and importance to the team go far beyond scoring, but rather into various intricacies of the game. Predators veteran David Legwand is in the final year of his contract. "He’s a highly skilled skater, has great vision, effective for us on the half-wall of the power play and a good distributor of the puck," said Trotz, whose team entered tonight’s game with 29 points and sitting in 12th place in the Western Conference. "He can carry the puck up ice and into the offensive zone, in large part due to his exceptional skating ability. Because of his skating and instinctive abilities, he’s been a player who can skate with and match up against the top players in the league." While he was the team’s first draft pick and has played a large role in the team’s development over the years, Legwand has left being the lead Predator when it comes to being the face of the organization up to other players. "It is what it is," Legwand said of his personality. "I don’t think there’s anyone that needs to be out front and center. We’re all the same type of guys in here." While Legwand is focused on helping the Predators return to the playoffs after missing out last season — they had made postseason appearances in seven of the previous eight years — he also is playing in the final year of his contract. After seeing fellow Predators stalwart Martin Erat traded last year, he understand the business might have him playing for another team next season or even as early as this season. "You never can look that far in the future," Legwand said. "It has been a fun ride. But who knows how long there’s left on it? So, I’m just out here to help win hockey games and do the right things." Trotz said the fact that Legwand is in the final season of his contract with the Predators has not impacted his play. 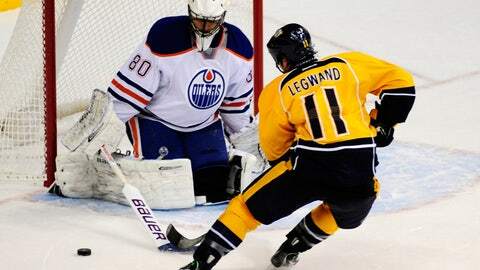 As far as Nystrom is concerned, when he thinks of the Predators, he thinks of Legwand. "When an organization keeps you for as long as they have with him, that itself speaks volumes," Nystrom said. "He’s been the face of the franchise for a long time. And he has continued to produce, which is what he is here to do. I have played against him a long time. He is a great player. "There’s a reason he’s here."